Well, here in New England we are mostly all back online from the October snow storm that broke our trees into pieces. Friends and family have been keeping their frozen goods in coolers, heating water in beer brewing equipment, and cooking on gas grills for a week or more. On the flip side of all of the stress and anxiety caused by lack of heat and power, folks really pulled together, reached out to one another, shared their homes, their showers, hot meals. Out of the bad came some good. This recipe is good for New Englanders this week on two counts: 1) it’s vegetarian, so if you lost all of your meats in the great non-electric thaw you can still make dinner and 2) if you’ve still got CSA veggies coming in (like me), this is a great way to use them. 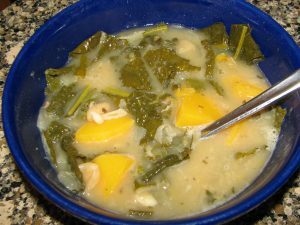 A bit of herbs (dried can certainly be substituted for fresh), a can of beans, a container of broth/stock, and your squash & kale and you’ve got a hearty soup that’s packed with flavor and nutrients. If you’re still cooking on the grill, and you’ve got a side-burner, you’re in luck. This recipe was inspired by a post on Whole Foods market’s site. 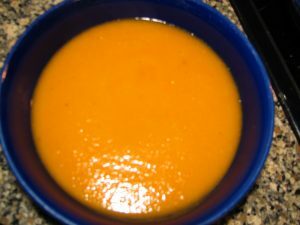 This entry was posted in All Posts, beans, butternut squash, kale, low-fat, onions, soup, thyme, vegetarian and tagged beans, butternut squash, kale, low-fat, onions, soup, thyme, vegetarian. Between entertaining out of town guests, exercising my right to a social life, training for the next big race (we have our mile down to 9:28- yay! ), and living life in general I have neglected my blog. For this I should be ashamed. But it is not for lack of cooking, or trying out new recipes. There is just not time enough in the day to get them all out on the internet 😉 That said…. We are entering the fall season very soon (9/23 to be exact) and with this new season come a whole load of new crops from the farmers. Our October CSA shares will boast of goods such as: beets, broccoli, cabbage, cauliflower, celeriac, collards, garlic, kale, kohlrabi, leeks, mustard greens, onions, potatoes, pumpkins, cool-weather spinach, swiss chard, sweet potatoes, turnips and squashes. As I tend to cook with what I have in the fridge, I’ll attempt to keep you stocked with interesting ways to use these fabulous ingredients. This particular recipe was inspired by World’s Healthiest Foods and turned out quite lovely. 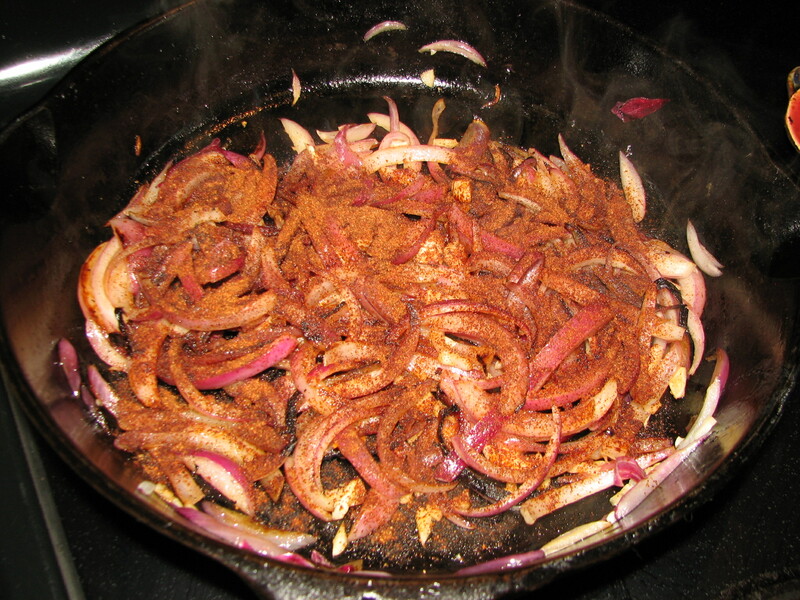 It fills the house with the warm smell of cinnamon and sweet onion while it simmers. 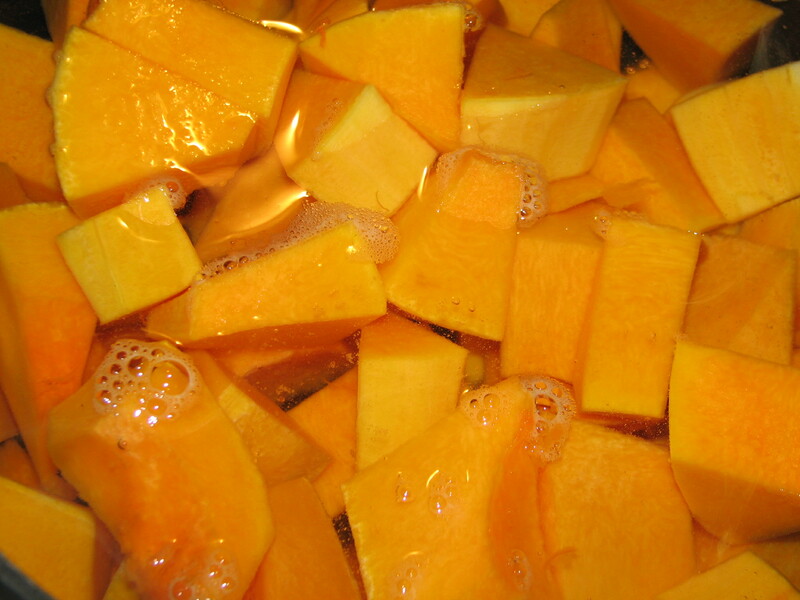 The finished dish is naturally sweet and the squash has a creamy consistency. We had this as a side to a chicken from our meat CSA which we had put on the rotisserie smothered with herbs de Provence. This entry was posted in All Posts, butternut squash, chicken, chili, cilantro, low-fat, primal, side dish, vegetarian and tagged butternut squash, chicken, chili, cilantro, low-fat, primal, side dish, vegetarian. Last night’s dinner was inspired by a package of butternut squash triangoli that we had picked up at Trader Joe’s. We needed a quick meal and this would fit the bill. I took one chicken breast, cut it in half, pounded it out nice and thin, and then floured & bread-crumbed it. That went into the oven at 400 for about 10 minutes per side, and was finished off with a bit of fresh parmesan. Meanwhile I sauteed some onion, mushroom, garlic, asparagus, green pepper and fresh spinach with pine nuts. 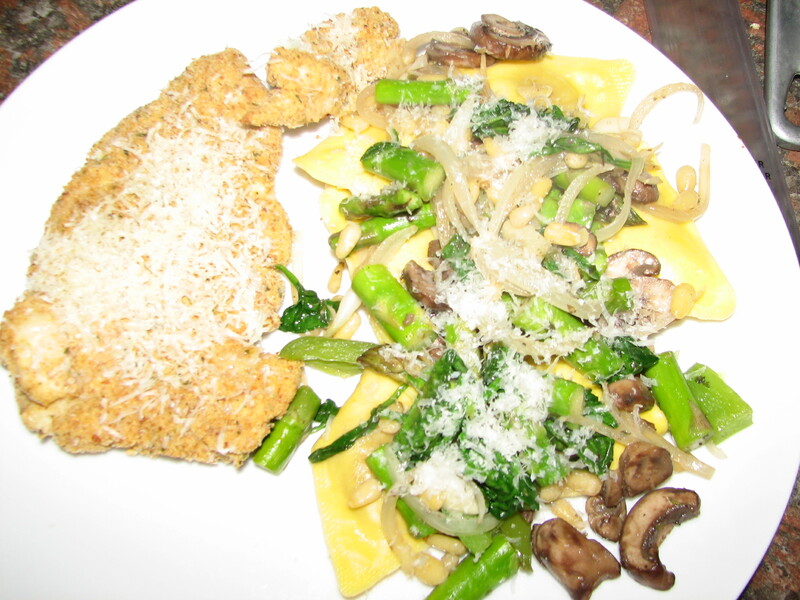 The triangoli cooked up in about 4 minutes, and the sauteed veggies went right over the top- again with a bit of parm. Twenty minute, healthy, well-balanced dinner. 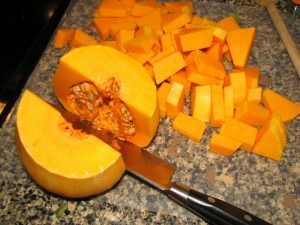 This entry was posted in All Posts, butternut squash, low-fat, pasta, vegetarian and tagged butternut squash, low-fat, pasta, vegetarian. Oh my goodness, I’ve got to quit eating like this soon or I’m going to weigh 400 pounds, but my body just won’t give up on this winter recipe eating regiment. I’ll have to up the workouts or something. When Neil and I were discussing menus for this week and making our meal selections he recalled a fantastic quesadilla that he’d had at a brewery some time ago. 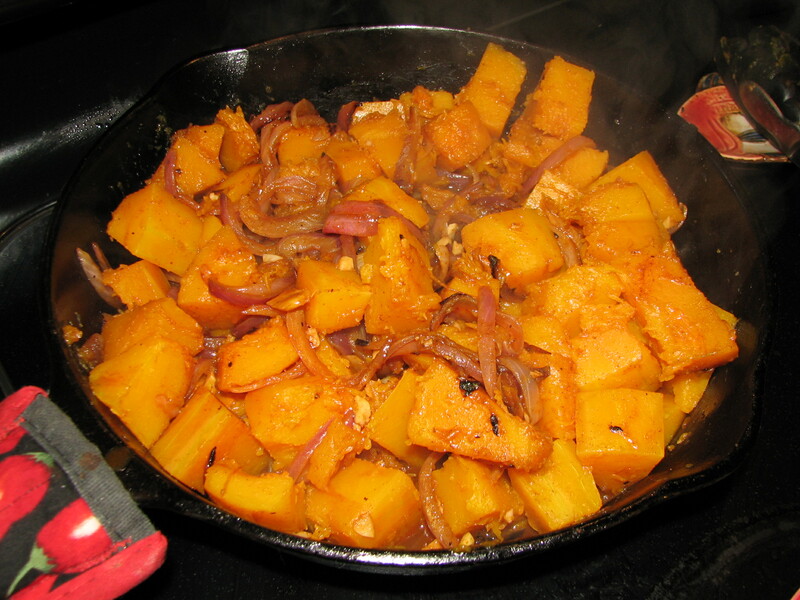 It was butternut squash layered with caramelized onions and gooey cheesy goodness. I decided to try and replicate that from description. 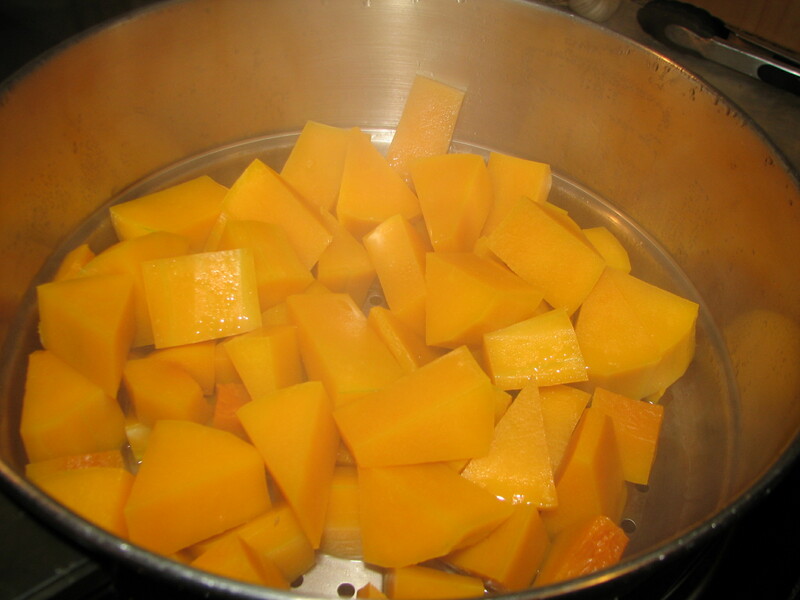 I started out by cubing up and boiling a butternut squash. Once it was thoroughly cooked I whipped it up with a smidge of butter, some salt, pepper, and maple syrup, and this concoction was set aside. 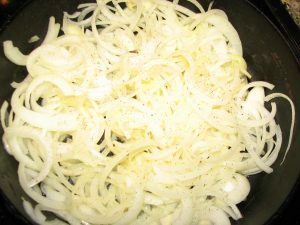 While the squash was boiling away I set two medium-sized onions to sweat in a cast iron fry pan with a bit of olive oil and butter over a low heat. By the time they were done, they were sweet like candy and a beautiful brown. Next up was the assembly. 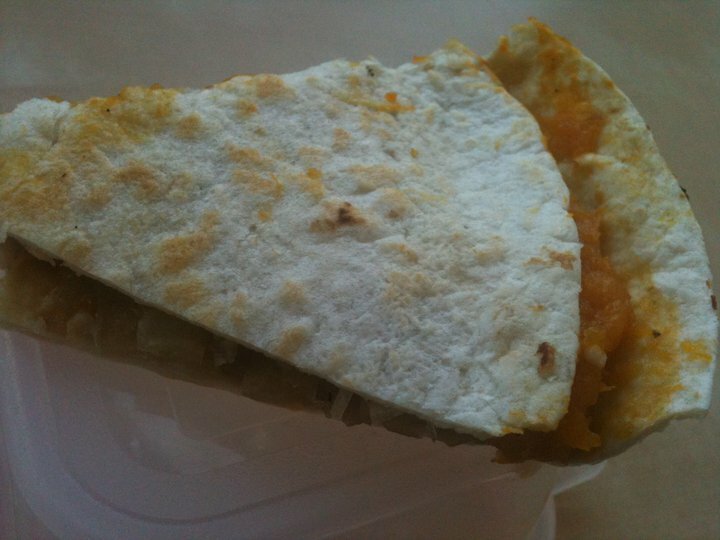 For the first one I placed a soft tortilla on a griddle pan over a medium heat and scattered it with finely shredded monterey jack cheese, then spooned on some of the whipped squash, a layer of caramelized onions, more cheese, and a second tortilla. By the time I was done assembling the quesadilla it was time to flip it over*. For the second one I used some local feta cheese instead for a very different flavor profile. As for serving, Neil preferred his sweet quesadilla topped with a spicy salsa. I liked mine just as it was. 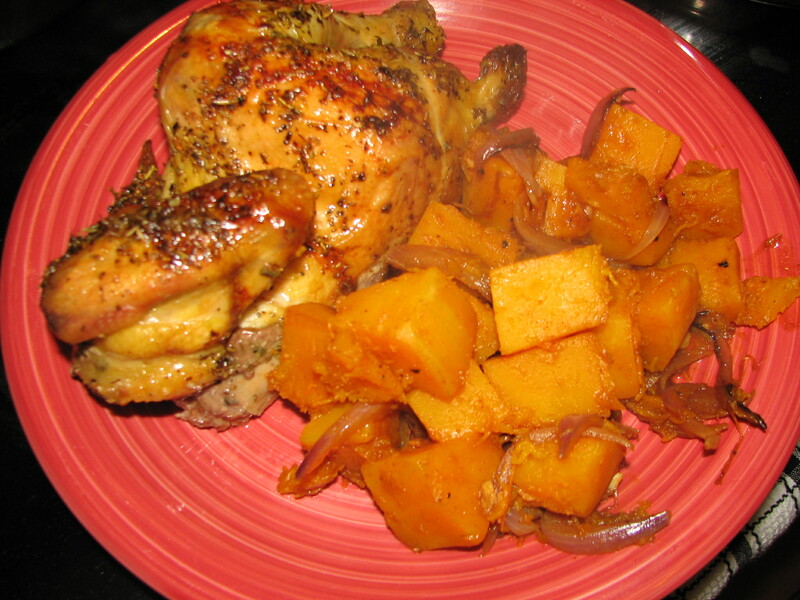 We accompanied this tasty dish with salads of field greens topped with roasted root vegetables (sweet potato, beet, onion and garlic) and a simple balsamic vinaigrette. Since they were so big, we both had left-overs. I popped mine in the fridge and had it cold this morning as a snack. *In the future I will make these with just one tortilla, folded in half as there was just too much food in the ones that I made and they were hard to handle (for flipping, eating). 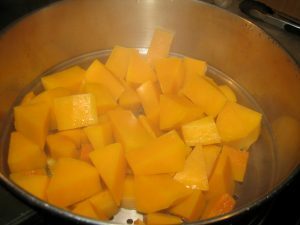 This entry was posted in All Posts, butternut squash, vegetarian and tagged butternut squash, vegetarian.